Down from the mountains now, and catching up on the world. The last couple days of climbing / hiking have been pretty incredible. The via ferrata concept is an amazing way to gain a perspective on a landscape that would otherwise be impossible without serious technical climbing, inaccessible to all but the most serious climber (and that’s not me). Instead, the routes I was climbing were populated (though far from crowded) by everyone from the very young (perhaps 8 or 9 years old, with parents obviously) to the rather old. In addition to the heavy German (Austrian, etc) population, there were plenty of Italians, a few French, and a handful of colonials (Aussies, Americans, Canadians). 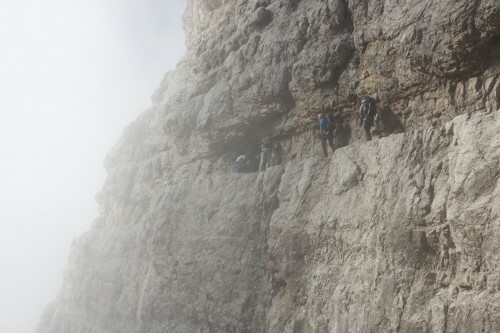 On Monday, I started with the “Bocchette Centrale” route, which many describe as the “typical” via ferrata route. 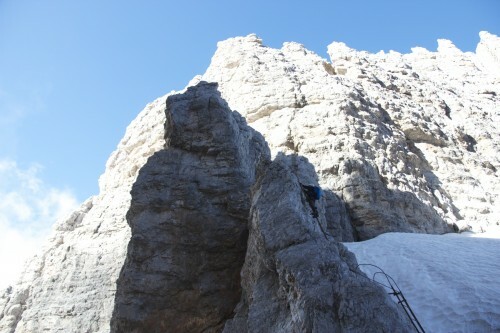 You start the route with a serious of ladders – a nice chance to get comfortable clipping and unclipping. Ladders are actually probably the riskiest type of obstacle you encounter. The ladders themselves have cold, wet, circular rungs, and are often rather wobbly. There’s a steel cable next to the ladder, running vertically, that you clip your harness to. At each point where the cable is bolted, you need to unclip and reclip on the other side of the bolt. This means hanging on to the ladder with one hand, while manipulating your binners with the other. When the ladder is overhung or tilted, that gets a little scary and requires some strength. A fall on a ladder means falling all the way down to the previous bolt – potentially 10 feet – plus the length of your ferrata rig. Something to be avoided. From there, the route transitions into protected ledges. Horizontal cabling, wide enough ledges that you can walk, but very, very big drops. If you do the full double-clip thing on these, it’ll take you forever – just walking carefully, with a hand on the cable, was good enough for me – most of the time. Sometimes you run into situations where you’re crawling or ducking, or where the ledge gets down to only a few inches wide – at that point, clipping becomes a bit more important. As you continue on, you cross a variety of passes, some flatter sections, and some vertical bouldering sections. Basically, a taste of everything. The sights are constantly amazing – whether completely shrouded in fog, or gloriously clear skies. The situation changes second to second – often by the time I’d unclipped my camera bag, the shot I’d been hoping for was gone. 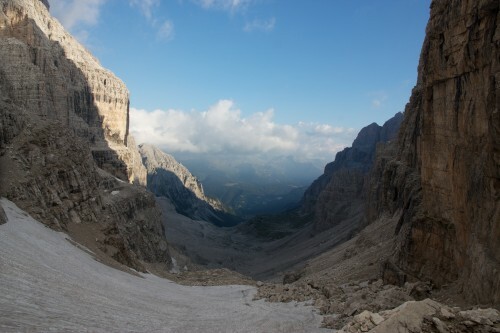 After Centrale, I paused for a bite at Rifugio Tosa, and then took Sentiro Orsi back the other direction. This is a slightly lower route, with relatively little via ferrata, but plenty of sketchy sections – big snow / glacier crossings, etc. It all ends with a massive scramble up a rock fall – at one point, there was cabling, but erosion and continued rock slides means the cabling is well out of reach. Once you’ve finished that climb, you immediately descend the other side, which is completely snow covered. It’s a slip / slide / fall sort of descent – too step in some places for much control, at least without crampons. 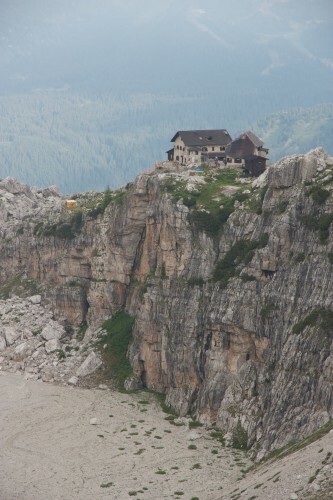 I spent the night at Rifugio Tuckett, which is perched right on the edge of a pretty stunning drop. The next morning, I did the SOSAT route – another slightly lower altitude route, but with plenty of via ferrata and some big ladders. About an hour in came the first clap of thunder. Within minutes, it was raining. Rain makes things a lot less fun, lightning makes it potentially far more dangerous. The rain was moderate for a while, but right as I reached the end, the skies opened up a bit more. 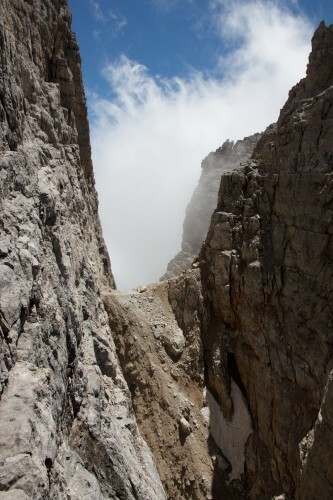 The final 400m ascent up to Rifugio Alimonta was very, very unpleasant. I gather other people were having similar issues with the sudden weather – from what I could understand listening in at Alimonta, a helicopter was stranded somewhere, trying to figure out what to do. I spent a while warming up at Alimonta, enjoying some cake and a coffee by the fire, drying out a bit. As quickly as the rain came, it left, and the skies were gloriously clear. So, I set out for the Detassis route. I hadn’t really understood in advance that this is considered one of the more difficult via ferrata routes in the region. And I hadn’t expected that I wouldn’t see a single other person the whole time. Had I known these things, I might have made another choice. Oh well, needs must. Detassis begins with a scramble up another big rock fall, with snow on either side. Finding the start of the route is a bit tricky – there’s not any real marking, and if the sun is in the wrong place, it can be hard to see the first ladder. Eventually I found it though, and started the climb. Detassis is almost entirely ladders – straight up, or even overhung. Climb, clip, climb, clip. For more than an hour. We’re talking big, big height here. When you reach the top, you have two choices – you can go north on the Bochette Alte, another very difficult route, or go south, complete the last of Bochette Alte, and end up back at Bochette Centrale. I chose the latter. That involved doing a very dangerous free climb traversal, which was probably not the smartest thing I’d ever done. But heading up Bochette Alte would have meant another 6 hours of hiking – not an option given the time of day. And descending all those ladders didn’t seem much safer. Finally, after reaching the end, I finished the day with another run at Bochette Centrale, to wind up back at Tosa for the night. In the morning, a long hike back down the mountain, and we’re all caught up to right now – chilling in a hotel room in Madonna Di Campiglio. Overall thoughts? 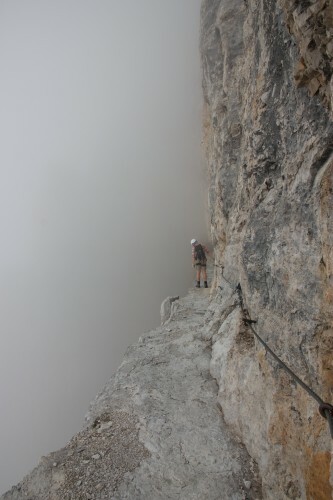 Via Ferrata is amazing. I’d do it again in a heartbeat. I was surprised that there wasn’t more social interaction. Obviously, I’m not a particularly social animal, but the fact that most people climb in groups (anywhere from two to seven or eight) keeps much serious interaction (between strangers) from happening at the rifugios. I thought it would be a bit more like the camino in that regard. I did enjoy getting to meet a few folks, but certainly not the way I expected. In terms of difficulty, the most physically strenuous part was just the hike up to the start of the routes. You can avoid that if you want by taking a gondola out of Madonna di Campiglio. You find your own comfort level in terms of safety. The Via Ferrata approach to placing cables seems a little like the way Upper Michigan decides whether a portion of highway allows passing or not – somewhat random. On the most dangerous parts, there’d always be a cable (or at least, there was once a cable). On more intermediary bits, it’s a bit of a crapshoot. The most important thing you can do is take things slow and focus on each foot placement. I think that’s where rock climbing helped me the most – I feel I’ve developed a pretty solid sense for when a foot is safety planted on a somewhat questionable surface, or when a quick movement is warranted. In any case, it was a great adventure, and now I can start thinking about what’s next. Anybody know how to get started BASE jumping? Congratulations on completing your challenging route. I am genuinely grateful not to make an unplanned trip to Italy to claim your body. Or what would be left of it. I sincerely hope that for the remainder of your time in Italy you will face nothing more dangerous than a very strong espresso. Just read this again and realized I was holding my breath as I imagined you doing these amazing things. I think it’s time for some quiet — e.g., hanging out with Fra Angelico at San Marco. If you do, say hello to the angels and evil things for me. Colin, what an incredible experience. I wondered about doing that journey with at least another climber, to share the experiences, but you made me feel the moves you made!